Observation - Butcher's-broom - UK and Ireland. Description: Bush, approx 50cm high. Flattened oval leaf-life structures ending in a spine. 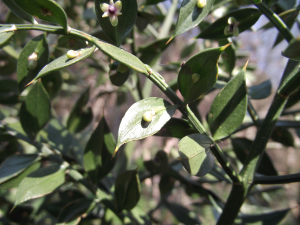 Buds and small flowers appearing in the middle of the leaf. Bush, approx 50cm high. Flattened oval leaf-life structures ending in a spine. Buds and small flowers appearing in the middle of the "leaf".